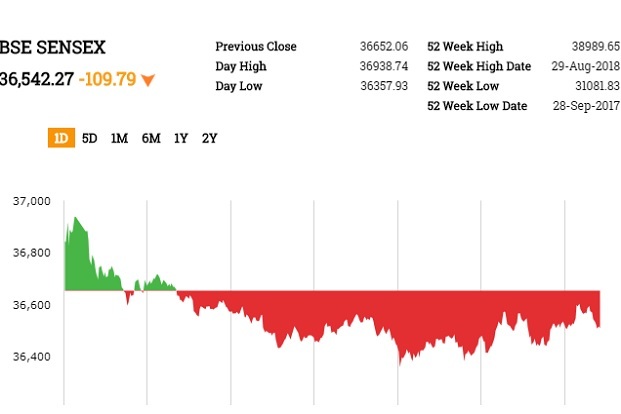 3.36 pm ISTClosing bell:The BSE Sensex closed 109.79 points, or 0.30%, lower at 36,542.27, while the Nifty 50 fell 13.65 points, or 0.12%, to close at 11,053.80. The BSE MidCap and SmallCap indices rose 0.42% and 0.12%, respectively.Among the sectoral indices on BSE, metal, realty, capital goods, energy and basic materials rose over 1%. IT, teck, FMCG and auto declined u to 1.6%.Vedanta, Yes Bank, Reliance Industries and Tata Steel were among the top gainers, whereas Tata Motors, Wipro, ITC and SBI were among the major losers. 2.48 pm ISTGovt approves Rs 4,500-crore package to sugar industry; Stocks fallThe government approved a Rs 4,500 crore package for the sugar industry that includes over two-fold jump in production assistance to cane growers and transport subsidy to mills for export up to 5 million tonnes in the marketing year 2018-19, PTI reported, citing sources. However, shares of sugar mills declined. Dalmia Bharat Sugar was down 2.28%, Magadh Sugar fell 5%, Uttam Sugar Mills declined 3.53%, Avadh Sugar & Energy was down 4.61% Mawana Sugars fell 4.92% Balrampur Chini Mills traded 4.56% lower and Dhampur Sugar Mills dived 6.93%. India’s dark corporate debt market now loses the flicker of liquidity tooEven if you refurbish corporate bonds by marking down their value or even adding an attractive new clause, buyers are unwilling to bite because exit down the line is difficult.